Keeping chickens is a flap-happy experience. Why? Well, thankfully, chickens need little care and maintenance. So, you have a LOT of free happy-go-clucky time to cluck the day away with your chooks! 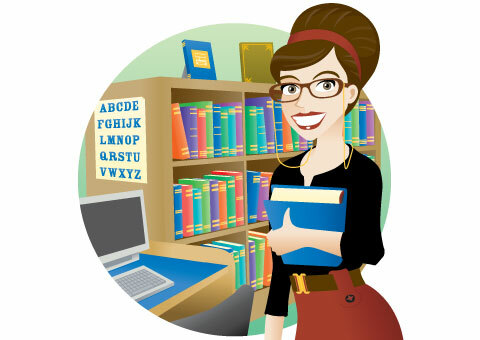 But, what kind of supplies and tools do you need? Let’s mimic a chook’s curiosity, and take a peck. A chicken’s most basic needs are shelter, food and water. So, once you’ve set up your chicken coop what’s next? Our Chicken Starter Kit comes equipped with everything you need to raise chickens, except the chooks themselves. Add chooks as you desire—a couple here, a trio there, a half a dozen in the spring, and so on until you’ve quite literally become the CrAzY chicken lad or lady. Store your chicken feed in our 60L secure Feed Drum. Feeding your chickens is a flap of the wing with our Treadle Chicken Feeder. Treadle feeders keep food dry and safe from hungry wildlife and rodents as well as reducing spills by 75%. Wow! 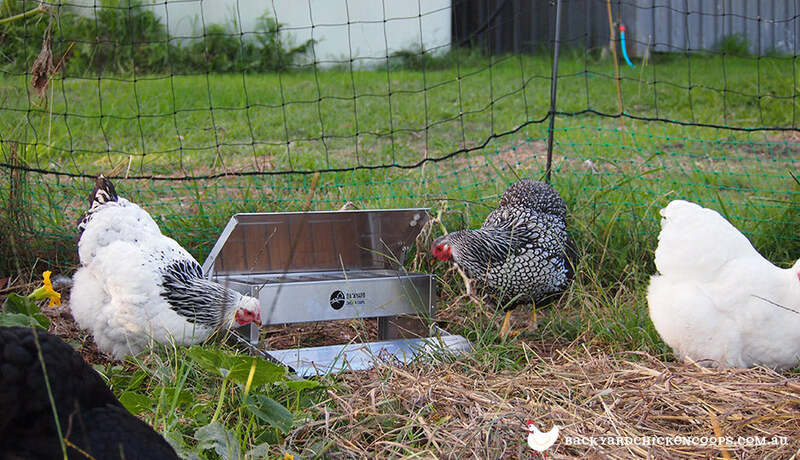 Make sure your chooks always have access to fresh, clean water with durable chicken waterers. Thankfully, security is our middle name! Protecting your feathery friends from the harsh elements, hungry and sneaky predators, and disease is our top priority. Add insulated roofing to the Penthouse or Mansion runs for egg-stra protection from extreme heat and harsh weather conditions. Add a bit of style with chicken coop shades. Your chooks will have it made in the shade with these lovely, deep-green shades. They not only keep your hens cluckily cool and comfortable, but they also provide a bit of privacy from prowling predators. Attach an auto door opener to your coop and invite freedom in. Simply program it to open up the coop hatch in the morning and close it up again at sunset. Put up poultry fencing. This easy to set up poultry fencing will add some extra wing-flapping room to roam and keep curious beaks out of your precious flower and vegetable gardens. If you want to deter predators from popping by try an electric poultry fencing option. Got predators? Wire Mesh Flooring to the rescue—safe for delicate chicken feet, yet a perfect barrier from predators are who are infamous for their crafty plots to burrow and slither underneath and pop up inside your chicken run. Our Hen Health Kit will keep your hens flap-happy and healthy—Apple Cider Vinegar, Diatomaceous Earth, Inca Pestene Insect Powder, Wormout Gel and Iodine Solution. Diatomaceous Earth is healthy dust! Simply sprinkle or “dust” your coop and nest box bedding and add a bit to chicken feed to help prevent parasites, deter ants, other creepy crawlies and flying insect pests, while boosting your chooks overall health. Add Apple Cider Vinegar to your chicken waterers offers egg-straordinary health benefits. Every time your chooks sip a beakful of water they’re boosting their immune system and creating a parasite unfriendly environment. Hemp Bedding is like a welcome mat into a healthy, happy, odor free chook coop. Organic hemp bedding is super absorbent and a natural pesticide. Spread it out on your coop floor and also in your hen’s nest boxes for comfortable egg laying egg-speriences. A small shovel or cat litterbox scoop are handy for scooping droppings. Use a paint scraper to easily scrape up stubborn, sticky droppings residue. Depending on the size of your flock and coop, it’s wise to have a large bucket or wheelbarrow nearby for carrying soiled bedding to the compost heap. Need a broom? Well, you just never know, so have one on standby. FYI: brooms or rakes make an egg-cellent set of helping hands—use them to gently guide your flock back into their coop at sunset. Every flock has at least a couple of dawdlers. 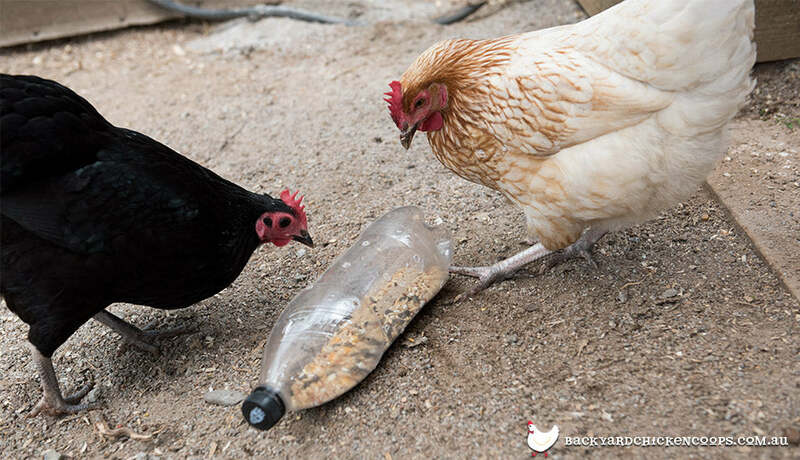 Give your chooks something to flap about—add some chook-friendly toys inside their run. Chickens love to be busy. Create a playground with these egg-cellent playful ideas. Hang up a Chicken Swing and tap into your chicken’s love for adventure and roosting. Your chooks will spend hours swinging to and fro while they admire the lovely scenery. Curious chickens just love to get their beaks into things. Treat your chooks to a treat ball or two—simply hide chicken-friendly treats inside, and let the ball roll. Shop around. There are a variety of treat balls or hanging treat containers available online. Chickens LOVE treats! And, treats are a great way to befriend new or shy chooks or to help strengthen the overall bond with your flock. Want to offer your chooks a treat that will make their taste buds go absolutely CrAzY? Give them mealworms. Mealworms are chock full of protein and fiber. They are fatty, so serve in moderation. 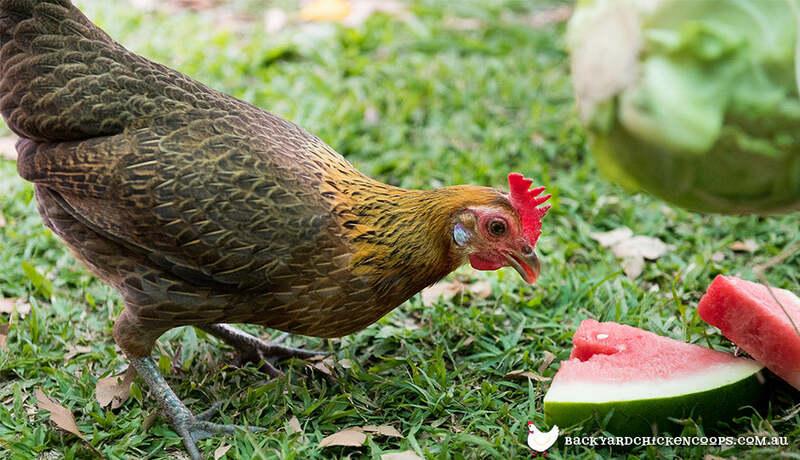 In summer feel free to offer your chooks some yummy water-filled fruits and berries such as strawberries, blueberries, watermelon, peaches (no pits), cantaloupe and grapes. In winter, cracked corn, oatmeal with raisins, and scrambled eggs are sure to warm up your feathery friends. For a list of chicken-friendly treats that’ll have your chooks flapping with glee, please check out our chicken treat chart. Chickens get sick. That’s a fact of life. They also peck on their feathery siblings, go broody, and injure themselves. Enter the Cluck House. Having an extra, smaller, and very mobile chicken house is handy. 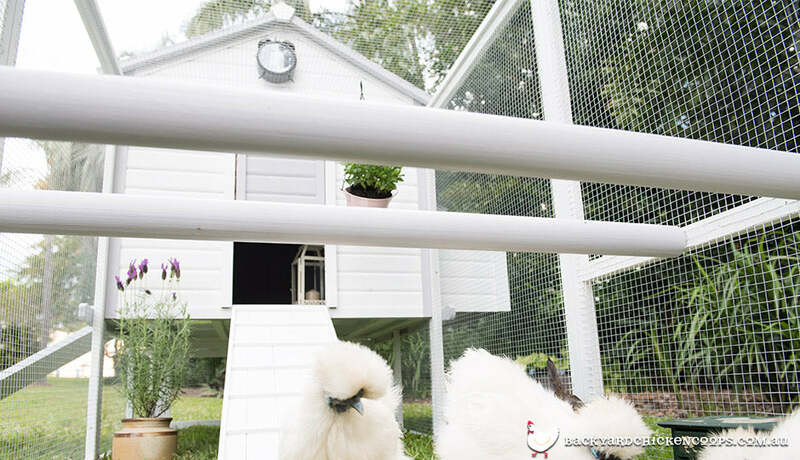 The Cluck House is the perfect solution for housing birds that need a little TLC or time away from their flock. One of the most exciting things about keeping chickens is collecting eggs. There is always a surprise—only one egg, LOTS of eggs, or a lovely assortment of differently colored eggs. One thing is true though…you need an egg basket to carry your egg-straordinary treasures back to the house.